A truly robust and integrated GRC program enables companies to take smarter risks, build a culture of ethics and integrity, and keep pace with constant regulatory changes. However, an effective GRC program isn’t built overnight and is essentially a journey that companies embark on, moving gradually up the GRC maturity curve till they have a well-integrated, coordinated, and optimized GRC program in place. Many organizations are well ahead on their GRC journey, while others are just starting out. 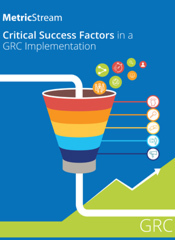 Wherever you find yourself, here are a few critical success factors to keep in mind to optimize your GRC investments.